NETWORK UPDATE: Final numbers awarded an extra 0.1 to CELEBRITY APPRENTICE, MADAM SECRETARY, THE SIMPSONS, BOOKLYN NINE-NINE, BOB’S BURGERS and CSI. The holiday continued for REAL HOUSEWIVES OF ATLANTA (Bravo), THE LIBRARIANS (TNT) and KOURTNEY & KHLOE TAKE THE HAMPTONS (E! ), all at the top of Sunday cable. HOUSEWIVES was up 0.16 to 1.56 (with lead-out THICKER THAN WATER at 0.70), LIBRARIANS dipped 0.02 to 0.95, and KOURTNEY was up 0.03 to 0.90 (lead-out TOTAL DIVAS was at 0.71). WORST COOKS (Food) was at 0.81, with lead-in GUYS GROCERY GAMES at 0.64 and lead-out CUTTHROAT KITCHEN at 0.60. On Discovery, ALASKA: THE LAST FRONTIER was at 0.79. 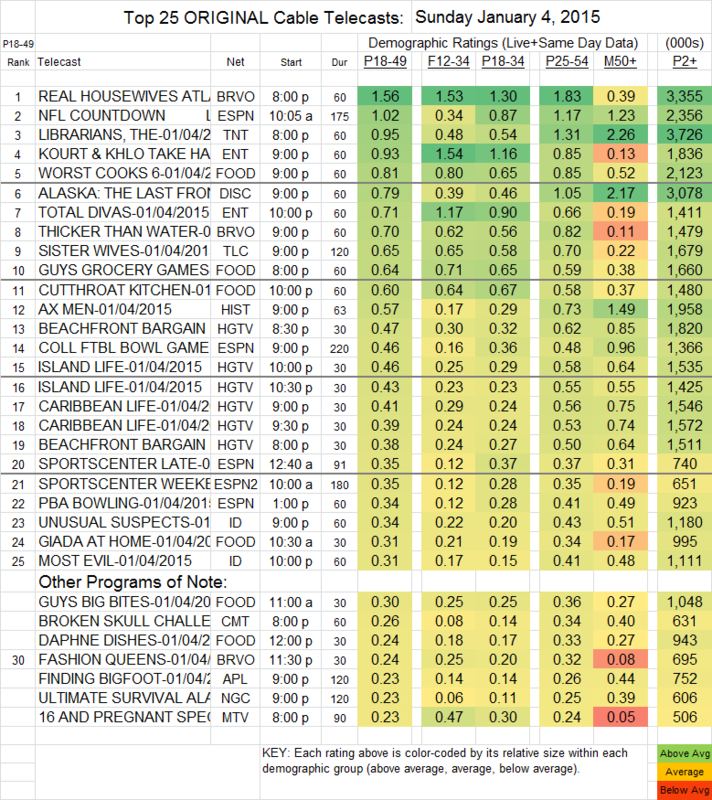 AX MEN (History) was steady at 0.57.